I would kindly ask for your help. I have just bought 2nd hand ASUS RX560-O2G graphic card (6 months old) and it seems that I have an issue with it. I have my picture on monitor, but when it comes to any 3D activity I am facing a problem and receiving warning that "there is no valid rendering device available". Also, my Device manager shows code error 43 - Windows has stopped this device because it has reported problems. (Code 43). I have performed several DDU uninstalation procedures (Safe Mode) and several installation of different AMD Radeon Drivers (the latest one and older) - with the same outcome. By the GPUZ shot it appears that it’s had a bad BIOS flash judging by the missing info and your Code 43. Does it mean that previous owner had tried to flash wrong BIOS or that card is "bricked" now? Is it reversible? Yes that appears to be the issue. Yes it’s reversible if you can find the correct BIOS in this sites database. I’ll just tag @eidairaman1 as he can quickly walk you through it. He's gonna need to post white stickers from back of card and if possible barcode from his original box. Memory and video out layout/configs are typically cause of bricking, hopefully the card wasn't damaged. Ram brand and timings and port layout maybe different from the card he actually has. Hapens when there is 2gpu in system or bios need to chainge. One of my buddies just brought over 3x RX560 from Gigabyte with the same issue. He used those for mining XMR for a few months, before giving up and ultimately parting out the rig. Cards were fully functional in his PC (Ubuntu+some modded drivers), but the first buyer returned the card within a couple of days saying that he is unable to install the driver (and gets ERROR 43 in device manager). He brought those over to me and I was able to confirm the problem on ALL of his remaining cards. The issue was his "optimized" vBIOS with modified timings. I've simply flashed the stock one from TPU vBIOS DB and now all cards are working again. Just download the latest ATIFlash, then get a proper BIOS and go ahead with flashing. Clock speed is way off there compared to the card advertised here. Also unverified bios files there is only 2. The last bios written for the gigabyte motherboard is from 2009- F6 version- way before uefi. Could be a uefi incompatibility too. Would it be useful to post other tabs form GPU-Z? @eidairaman1 - I am aware that my MoBo is ancient - I have flashed the latest BIOS (F6 version that you have mentioned) last night. I have recently used R7 250X on it, without an issue. You are correct - it seems that UEFI can be an issue. Anyway, there was a plan to upgrade my machine in some closer future - I would only be glad to be sure somehow that graphic card is OK itself (no hardware issue) and prepare for upgrade. I am not here to insult you on the age of the rig. I only was giving truth about the situation and only trying to help. Ok to prevent further peril so you can recover incase 1 of the 3 bios files fails and you get no display at all, Do not flash your GPU till you do this first, then get back with us. 1. This may make no sense but buy a cheap PCI (Not PCI Express) video card. Put it in, hook your monitor up to it, don't bother installing any drivers for it. 2. Back up your existing gpu bios file. Change the name without changing the extension to something easy you can remember. Grab other bios files do the same to them. 3. Write down all directory paths to those bios files in case you need to do a command line/dos prompt emergency flash. My Signature has all info needed to do such a flash, but before you do anything you gotta have a backup plan. Please, take my apologize - I did not have an idea that my reply could sound that I am offended by comment about my MoBo and rig. I really appreciate your efforts and all suggestions. As I have performed backup of VBIOS from graphic and downloaded these other VBIOS files - what would be next step? Should I flash VBIOS from Windows, as suggested above? There were threads that suggests usage of DOS bootable USB. Ok do not bios flash till you have a pci graphics card that you can have your monitor running off of just incase your 560 bios flash fails. @eldairaman1 - thanks for your instructions and great help. Thanks also to other forum members that shared their thoughts on this issue. Due to my and card seller's impatience - I have been told by card seller to flash VBIOS from TPU, by using ATIWinflash tool (he accepted all potential risks for this procedure, with money-back option). I suppose that this was not quite smart and reasonable behaving, but that is how thing went yesterday. I have found backup old PCI-E card in case that something went wrong. Everything went well and smooth - suggested VBIOS was flashed without issues and Code 43 error has disappeared from Device Manager. 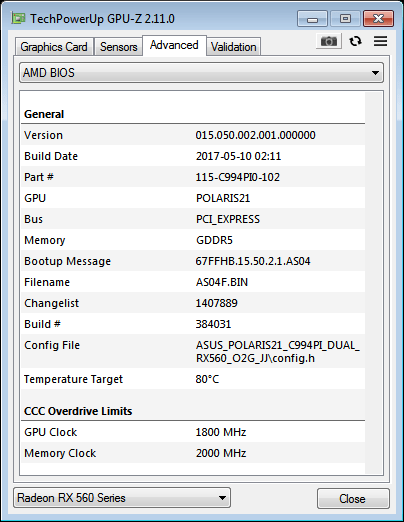 Drivers have been regularly installed and GPU-Z have recognized the card (please see screenshot). I have checked card in some benchmarks - score is as expected. It's behaving in WoT is regular, without any issue. I really hope that this would be it. I have attached "original" VBIOS that came with the card (status of Code 43 error). 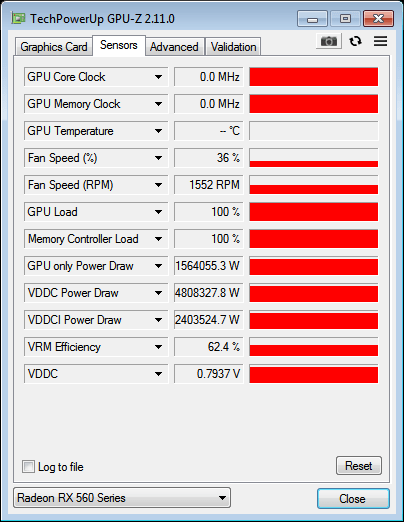 There is also VBIOS (saved by GPU-Z from the card, after flashing) that is suggested here. It was not needed to use any of those 2 unverified VBIOS that are also in TPU database. I have also attached screenshot from ATIWinflash - it seems that both of these 2 VBIOS had the same name but their size was different. I think this is that thing about the driver needing patched(with the AMD/ATI Pixel Clock Patcher) for use with a modded Polaris BIOS. when you modify your card, your checksum changes, from a value that is known to the driver to a unknown value, the pixel patcher, reads your new checksum value and then modifies the checksum values in the driver so that it doesnt give a error 43 and render the card not usable by the OS. 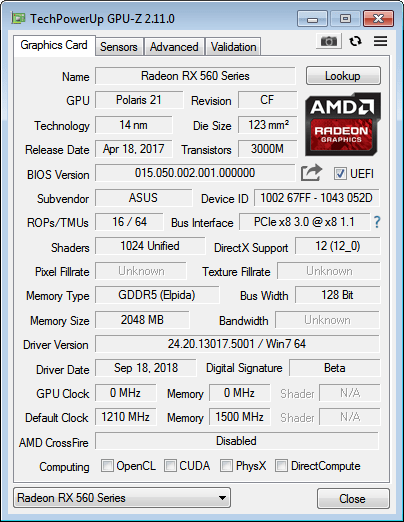 If I understood this correctly - it is possible that I have bought modified, modded, slightly changed RX560 with VBIOS that has required Pixel Clock Patcher for appropriate functioning. It seems that card seller was not aware of that as he was suggesting me to flash VBIOS instead of using Pixel Clock Patcher to make card acceptable to Windows driver.